String là một trong những nguyên tắc cơ bản của ngôn ngữ lập trình Java. Nó không phải là một kiểu dữ liệu nguyên thủy như int, long ordouble.Nó được định nghĩa trong gói java.lang và đóng gói nội dung của nó trong một mảng ký tự. Trong bài này, chúng ta sẽ khám phá ra một số sự kiện chuỗi thú vị, có thể giúp hiểu rõ hơn về hành vi của lớp phổ biến này . There is a powerful and simple concept in programming that is really underused: Immutability. Có một khái niệm mạnh mẽ và đơn giản trong lập trình mà thực sự là không được tận dụng : Tính bất biến . Về cơ bản, một đối tượng là không thay đổi nếu trạng thái của nó không thay đổi khi đối tượng đã được tạo ra . Do đó, một lớp là không thay đổi nếu trường hợp của nó là bất biến . There is one killer argument for using immutable objects: It dramatically simplifies concurrent programming. Think about it, why is writing proper multithreaded programming a hard task? Because it is hard to synchronize thread accesses to resources (objects or others OS things). Why it is hard to synchronize these accesses? Because it is hard to guarantee that there won’t be race conditions between the multiple write accesses and read accesses done by multiple threads on multiple objects. What if there are no more write accesses? In other words, what if the state of the objects threads are accessing, doesn’t change? There is no more need for synchronization! Immutable classes are also well adapted to be key in hashtables. The objects on which the hash values are computed must be immutable to make sure that the hash values will be constant in time. Indeed, hash value is computed from the state of the object. 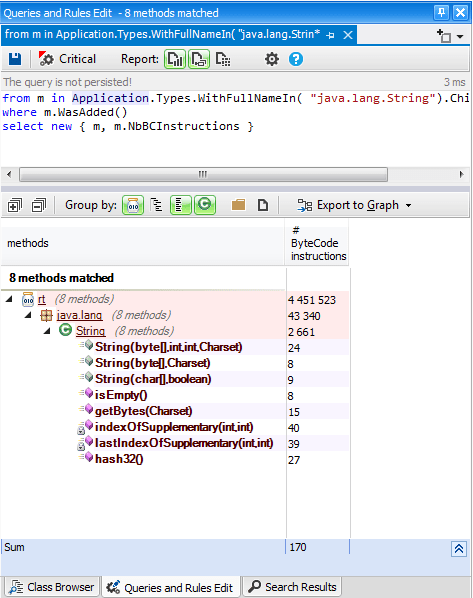 Of course, doing so comes at the cost of creating multiple string objects in memory when doing some intensivestring computation. In this case, you need to use the StringBuilder class. For some modern languages like Scala, immutability is preferred. The default collection classes are immutable. It’s interesting to know the most used types in a project, indeed these types must be well designed, implemented and tested. And any change to them could impact the whole project. As expected, Object is the most used one, however there’s another interesting metric to search for popular types:TypeRank. 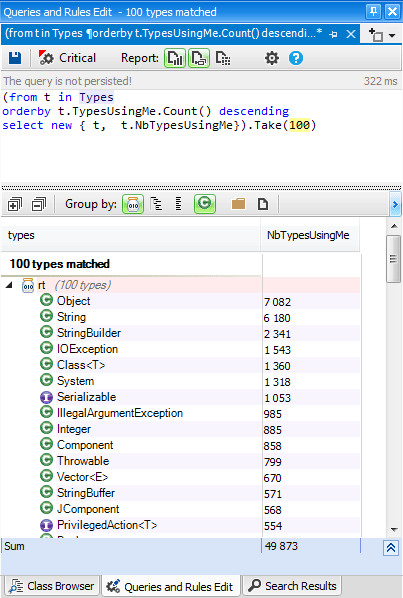 Using TypeRank metric which is more accurate to search for popular types, String is more popular than Object in the JVM codebase. It’s recommended that the most popular code elements must be stable, indeed any changes could impact many other types, let’s discover if it’s the case of String, for that we can compare the JVM 5 released in September 30, 2004 and the last update of JVM 7 released in October 15, 2013. Only 3 constructors and 5 methods was added. 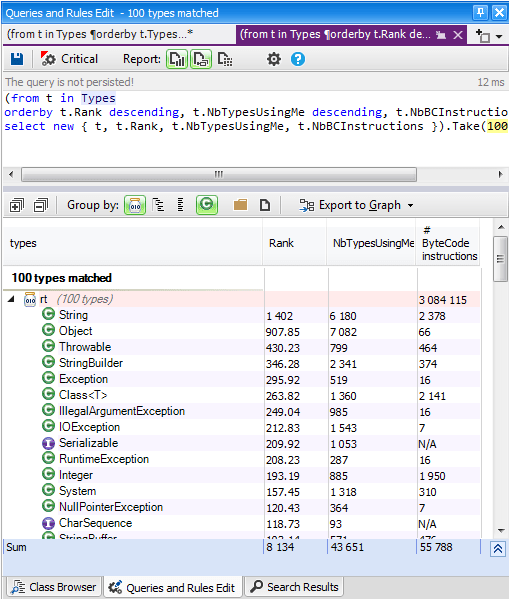 Only one constructor was deprecated since 2004. 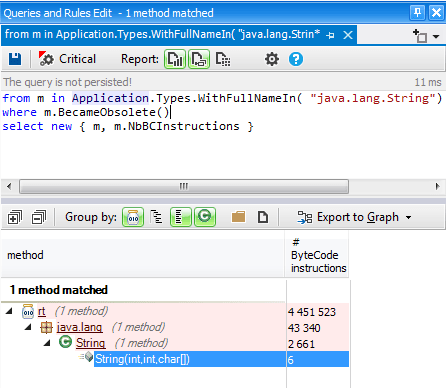 Strings receive special treatment in Java, because they are used frequently in a program. Hence, efficiency (in terms of computation and storage) is crucial. Java has provided a special mechanism for keeping the String literals – in a so-called string common pool. If twostring literals have the same contents, they will share the same storage inside the common pool. This approach is adopted to conserve storage for frequently-used strings. On the other hand, String objects created via the new operator and constructor are kept in the heap. Each String object in the heap has its own storage just like any other object. There is no sharing of storage in heap even if two String objects have the same contents. You can refer to this post for more details about the String pool mechanism. locale is used early in the method body, the JVM throws the NullPointerException if a pointer is nulland it’s very uncommon to throw explicitly this exception. However many methods from String use this technique to avoid executing more code in case of abnormal cases, which could minimize the CPU usage.